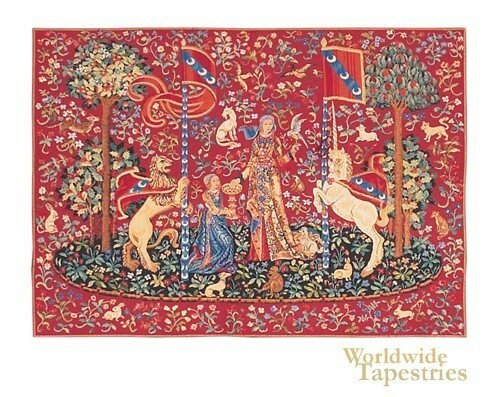 “Taste (Le Gout) II” is one of six tapestries in the historic “The Lady with the Unicorn” series. Commissioned by Jean Le Viste as a memorial to his appointment to Louis XI’s royal court, the original along with the five companion pieces are on display at the Musee National du Moyen Age. This particular tapestry depicts “taste”, one of the five senses (touch, sight, smell and hearing are the other four). The family crest of the Le Viste family is prominently displayed on the two banners. The Le Viste crest is composed of a red and blue background with three white crescents. The tapestry shows the classic Mille Fleurs style of background that was popular in Flanders at the time of its creation. Following Le Viste’s death, the set was broken up among family members. This wonderful reproduction is lined on the back and has a tunnel for easy hanging. Dimensions: W 23" x H 18"
Dimensions: W 36" x H 28"
Dimensions: W 78" x H 54"